First Vanadium president and CEO Paul Cowley at the Carlin vanadium project in Nevada. Credit: First Vanadium. First Vanadium Corp. [FVAN-TSXV; FVANF-OTCQX; 1PY-FSE] has released impressive metallurgical test results for nine variability composite samples from its high-grade Carlin Vanadium deposit near Elko, Nevada. The company said preliminary test results are consistently showing high vanadium extraction rates, between 92% and 98%, for both oxidized and unoxidized mineralized material of low, average and high vanadium grades. “The company is very pleased with the consistent variability testing results that demonstrate excellent vanadium extraction rates across the deposit, achieving another significant objective in our test work,” said First Vanadium President and CEO Paul Cowley. The test results have been released just weeks after the company announced a maiden resource estimate for the Carlin Vanadium deposit, a move that coincides with a steep rise in the value of the company’s stock price. However, after hitting 98 cents on March 4, 2019, the value of the shares has since slipped back to 69 cents on Friday. The shares currently trade in a 52-week range of 40 cents and $1.96. The company said the NI 43-101-compliant resource estimate for the Carlin deposit was completed by SRK Consulting (U.S.) Inc. and replaces an earlier estimate that was announced in 2010. The resource estimate is justified by two drilling campaigns, comprised of 89 holes. That program verified historic drilling, twinned six holes, either replacing or demonstrating improved grade, and in-filled to tighten the previous drill pattern. As of February 1, 2019, First Vanadium said it has outlined an indicated resource of 24.64 million tonnes of grade 0.615% V2O5 or 303 million pounds using a cut-off grade of 0.3% V2O5. On top of that is an inferred resource of 7.19 million tonnes of 0.520% vanadium or 75 million pounds. The deposit is now considered to be the largest, highest grade primary vanadium deposit in North America, First Vanadium said in a press release on February 27, 2019. Vanadium is growing in importance for key industrial manufacturing sectors, notably in steel, including rebar, and renewable energy. More than 85% of the world’s vanadium is used in steel manufacturing applications. In the last three years, prices for 98% flake V2O5 have steadily risen from under US$2 a pound to US$27.45, and now sits at US$14.60. The Carlin Vanadium deposit is a black shale-hosted flat to shallow-dipping vanadium deposit located a shallow depths, from zero to 60 metres below surface. It is located on a property that consists of 72 unpatented mining claims, covering 1,140 acres. 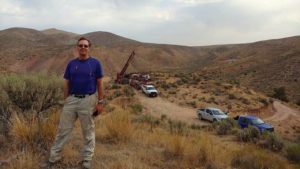 First Vanadium (formerly Cornerstone Metals Inc.) has an option to earn a 100% interest in the Carlin Project, which is located six miles south of the mining community of Carlin. The deposit was discovered by Union Carbide Corp. in the 1960s via 127 rotary drill holes. First Vanadium is now aiming to fast track the project in a bid to unlock its value. On Friday, the company said it commenced acid leach and pressure oxidation test procedures on a single composite sample from the Carlin deposit in April 2018. In June 2018, the reported test work indicated 95.5% vanadium extraction into solution. Subsequently over a number of months, the extraction process has been further refined and the company has progressed to the stage of variability test work. Variability test work typically uses multiple samples of differing grade and ore type from across a deposit to determine the processing consistency of a certain procedure. Nine composite samples from drill holes across the Carlin Vanadium deposit tested two different ore type (oxidized and unoxidized shale) of varying vanadium grades (low 0.39-0.54% V2O5, average 0.62-0.69% V2O5, and high 0.93-102% V2O5) through an acid leach and pressure oxidation procedure. Test results are consistently high vanadium extractions into solution, between 92% and 98%, demonstrating a tight range of high vanadium extractions across the deposit regardless of grade or whether oxidized or unoxidized material. The variability test work results provide further input for the advancement of a process flow sheet that requires a downstream solvent extraction step. First Vanadium said the solvent extraction test work in progress at SGS Canada, is aimed at producing ammonium metavanadate and a final vanadium pentoxide product.